Here is the third chapter on 2016 Black Friday sales. Stay tuned for more on Cyber Weekend over the next day or so. For Black Friday and Cyber Weekend, beauty retail giant LookFantastic, and sister concerns Beauty Bay and HQHair, are offering a series of massive savings across brands. LookFantastic is also launching a Black Friday-exclusive Bumper Beauty Box, with a whopping 12 products worth £100, for just £20. All this and more, further below. 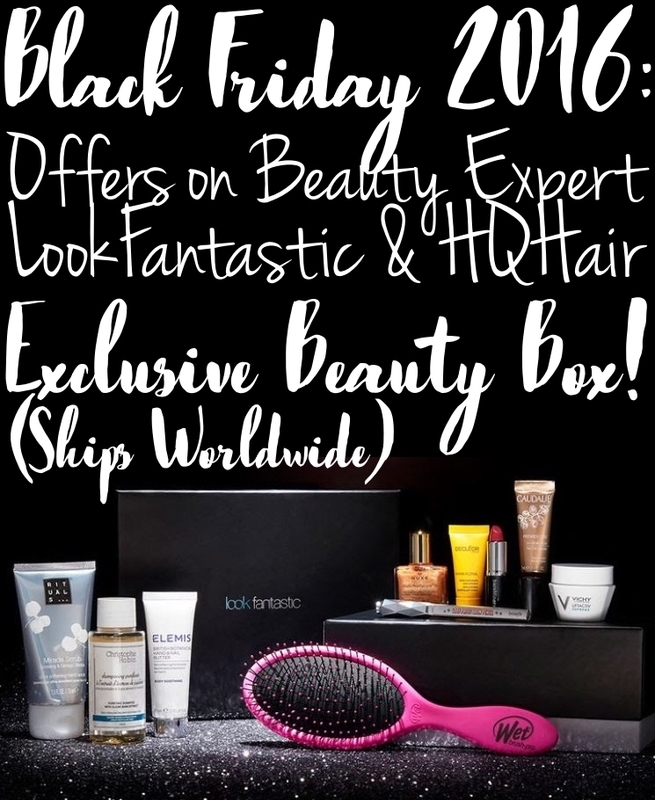 Scroll down for sales, codes, and exclusive launches on LookFantastic, Beauty Expert and HQHair for Black Friday 2016. Site-wide: Code LFBLACK for 25% off. Shop here. Exclusive Black Friday Bumper Beauty Box worth £100 for just £20, on Black Friday alone. The Black Friday Bumper Beauty Box will contain a minimum of 12 products, and will be worth £100. It is priced at £20. The photographs are for illustrative purposes only. Shop the complete Black Friday sales on LookFantastic. Code LFCYBER gets you 20% off through Cyber Weekend. 25% off Foreo, plus another 5% off, with code CYBERX5. The same code above may be used for Kerastase, and Mio Skincare. £22 off selected GHD Stylers. 20% off selected premium beauty products, including Estee Lauder, Origins, Clinique, and Aveda, with code PREM20. Site-wide: Code BLACK gets you 20% off. This declines to 15% over the weekend. Free Beauty Bag with code CYBER15. 3-for-2 on Eve Lom, Elemis, Omorovicza, REN, Real Techniques, Ole Henriksen, This Works, Korres. 20% off Pai, Jurlique, Caudalie, Illuminage. Site-wide: Code BLACK gets you 20% off on Friday, with 15% for the weekend. 3-for-2 on Christophe Robin, Tangle Teezer, Elemis, REN, and ThisWorks. 25% off Redken's core range and 30% off bundles; free full-size United Multi-Benefit Treatment worth £13.60. 30% off Bourjois, Pureology, and Grow Gorgeous (get the serum, y'all!). 25% off Decleor and L'Oreal Professional's Core Range. 20% off Illamasqua (free mini Hydra Veil with every purchase). I'm repurchasing Pai's Rice Plant and Rosemary Bioaffinity Tonic, REN's ClearCalm Cleanser, Clarimatte Toner, and Rosa Centifolia Hot Cloth Cleanser, Oskia's Renaissance Mask, and Pixi's Cleansing Balm. I'm also going to look at some Antipodes and Trilogy. What are you hauling on Black Friday? Brand- and sale-exclusions may apply.